A few weeks ago I wrote this post which showed the results of my empirical study on the effect of private sector debt on the economy. It found that a 10% increase in the level of private sector debt corresponded to a 0.15% decrease in GDP growth every year going forwards. Considering that the levels of private sector debt in many advanced economies is around the 200% level, this is a pretty big drag and on its own would explain the current secular stagnation. I then formulated a simple model which gave a possible mechanism which could explain how debt is responsible for the lower GDP growth. This post here will provide further empirical evidence that the model represents a reasonable hypothesis. I realised that I started with the idea of debt causing stagnation, and then assumed that it was due to a reduction in workers share of income and that this caused the stagnation. However, on reflection, I realised that I had not empirically shown the intermediate part - that there has been a decline in workers share of GDP. I will summarise this model here briefly. I divide the economy into 'savers' who have invested money in bonds, property, shares and put it in the bank, and 'workers' whose work in the future will pay the savers dividends, rent and interest from their future work. By definition, all value of savers savings comes from work done by people in the future. If the workers decided not to work then the savings would be worthless. There is nothing wrong with saving; it is an important way of transferring consumption from the present to a time when it is needed in the future, for example old age. However, my thesis is that the rise in debt - which is matched, as an accounting identity, by an equal rise in savings - has made the amount owed by the workers to the savers too high. Because of debt there are now too many savings. Now, this would be fine for the economy (if harsh on the workers) if the savers spent the same proportion of their income as the workers. However my argument is that the marginal propensity to spend of the receivers of dividends, interest and rentals is much lower than the marginal propensity to spend of the workers who pay it (either directly or indirectly). So I argue that the situation we are now in is one in which too much money is diverted from the workers to the savers. Workers today are burdened by corporate profit share of GDP that is very high, with interest payments on a huge amount of debt and with rental payments that are very high. This drains demand from the economy as the money is diverted to people likely to save it. If the savings in the economy go up then one of two things must happen. Either more debt must be taken out (either by the government or the private sector), or the economy will decline and unemployment will result. For the past 30 or 40 years debt has been rising on a huge scale. This has helped growth when it was taken out, but cost in the future. The rising cost had been masked, up until 2008, by even more debt and everyone was happy (with a few exceptions). Now we have reached a stage where we can't take out much more private sector debt, governments are reluctant to spend more and developed economies are in a stagantion. Even with share prices at all time highs, in many countries the economy only just stays in growth with large government deficits. So this is where we are now. The liabilities of the workers to the savers are too high for them to afford. And the cost to the economy is that we can't get growth any more without further debt. 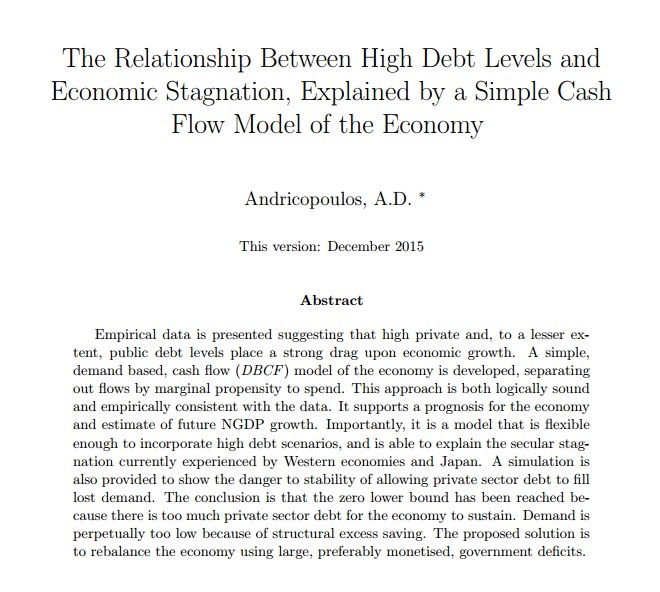 My model explains the empirical link between rising private (and public) sector debt and slowing growth. But I realised that I hadn't checked the intermediate points. 1) Increasing private sector debt causes an increase in liabilities from workers to savers. This would appear at first glance to clearly be true. The lower interest rates we have seen recently will reduce the servicing costs but even now, a lot of private sector debt is at as high real interest rates as ever. 2) Therefore the workers share of GDP should go down. I realised that I had not checked this empirically. The point of this post is to look at empirical evidence which shows that this is true. This is almost certainly true. Average workers (with fewer assets) tend to spend 90% of their income. Richer people spend closer to 50%. The super rich, much less. The main argument I have for this is that empirically the cost of debt appears to be so high. And on its own it, if this were further verified, it could explain the entire stagnation we are suffering. So for my thesis to be true, it would be necessary to show that 2) is true. That the workers share of GDP has come down. I realised that I have not shown this so I did some searching. The first port of call was the St Louis Fed Fred database. Here I found the following graph for the US. This is a remarkable graph for a number of reasons. The first is that it shows that the percentage of wages as share of GDP has gone down from around 50% until the mid 1970s to around 42.5% today. The greater corporate interest payments caused by corporate debt must have taken a large proportion of this. This is very important as it is verification that the thesis I put forward does hold in practise. 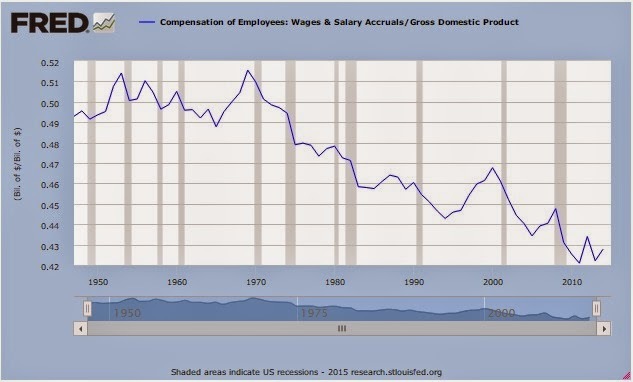 On top of this, the graph is interesting because they have shaded the periods of US recession. You can see that every single one of the last 10 recessions coincided with a drop in the value of compensation to workers. Looking on the internet, this pattern is repeated across the world. There are different ways of measuring but in every case I have seen there is at least a 5% reduction in GDP share to the worker. But this is not even the whole story. This shows lower share of GDP going to the workers from their employers. But then even when the money arrives they still have to pay rent and interest on their houses and consumer credit. Martin Wolf states in a recent piece on the UK election that 70% of net bank loans outstanding are to individuals secured on property. What is the result of all this credit? House prices have rocketed. And because of the unaffordability of housing, most young people are forced to rent which has driven up rents. This piece of research shows how rents in the US have gone from just over 20% of income to almost 30% of income in the last 35 years. This means that of the 42.5% still going to employees, an extra 10% is still going on rental. And in the UK the situation, due to planning restrictions on house supply is worse. This reliable source suggests that the proportion in the UK is 50%. For those not from the UK it is not a reliable source, but it does show the problem. Yet another consequence of the rise in debt is that the banking sector becomes a lot larger. As intermediaries they take a spread on the debt between borrower and lender. This estimate suggests that the banking sector takes 9% of GDP. A reasonable proportion of this will go to highly paid employees with lower propensity to spend. Marginal propensity to spend of savers and rich bankers is 40% lower than workers. This is obviously very back of the napkin but you can see the potential cost in demand. Every year savings are 5.5% more than equilibrium (assuming equilibrium in 1970). This saving has to be compensated for by either a rise in private sector debt, an increase in government debt or unemployment. This is, I believe, the problem the economy is currently facing. And it is all caused by debt. I will end, as usual, with a restatement of my belief that we need to print central bank money slowly to spend and invest in the economy, stimulate growth and inflation and reduce the real burden of all the debt we have amassed.